You’ll then have the opportunity to see which crystal(s) you are most drawn to, and explore the reason for this as the crystals you are most attracted may reflect the qualities you wish to enhance in your life. 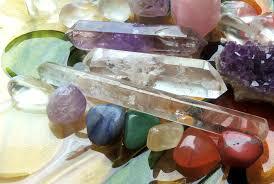 We will look at crystals in action, crystal healing and how crystals can improve our state of wellbeing. Please bring some of your own crystals so that Yolande can help you identify them and learn to identify with them (although it doesn't matter if you don't have any to bring). We’ll then enjoy a short yoga practice together, to help to move stagnant energy and refresh and awaken, before enjoying a guided chakra balancing relaxation using a selection of crystals (corresponding with your seven chakras) to leave you feeling calm, enlivened, grounded and centred. What to bring: Yoga mat and blanket. Please feel free to bring up to ten of your own crystals with you, but don't worry if you don't have any to bring. Cost: £30 including refreshments and a pack of seven chakra balancing crystals to take home with you. How to book: All spaces are now filled with a waiting list. Please email Emma at emma@beinspiredby.co.uk if you'd like to be added to the waiting list, and/or if you'd like to join the next course.